The city of Berkeley’s proposed ordinance isn’t about debating the role that cell phones play in the causation of cancer and other medical disorders. The fact that biologists can demonstrate that electromagnetic radiation generated by cellular phones has biological effects that can lead to oncogenesis — is reason enough to take action and protect your loved-ones without further adieu. The Right To Know ordinance is about the fact that cell phone manufacturers are hiding consumer warnings to never carry or use a cell phone directly against your body because you’ll risk being exposed to radio frequency energy that may exceed the federal “safety” limit. An ordinance like this is needed because retailers are not informing their customers about cell phone radiation safety. People are supposed to see these warnings which are required by the federal government for their protection. However, most cell phone users are not aware they must keep anywhere between 5mm and 15mm (5/8 inch) separation between a cell phone and their body. All new Smartphones – before they can legally be sold – are required to undergo SAR testing to ensure RF radiation levels don’t exceed a specified amount for human safety. You need to know, the FCC is an industry led federal agency entrusted to oversee this testing standard protects the public, but instead allows manufacturers to “cheat” on this test by holding cell phones up to 1 inch away from simulated body tissue so radiation levels appear much lower. This enables manufacturers to pass SAR testing which would be unlikely if cell phones were tested in the manner in which they are used by real people – directly against the body, in pockets and tucked into waistbands and even bras (see “No Phone Zone! Cell phone in bra may cause breast cancer”). HOW IMPORTANT IS THIS SEPARATION DISTANCE? It doesn’t sound like a big deal to have to keep such a small distance between your body and your phone, but following the laws of physics, even separation distances as small as ¼ inch can make a significant reduction in the amount of radiation exposure we receive. The Inverse Square Law of Physics states intensity is inversely proportional to the square of the distance from the source. So, the intensity 1 inch away vs 1/4 inch away is a 16 fold difference. In other words, measurement of RF at 1 inch away is 1/16th LESS than measured at 1/4 inch away. Allowing the wireless industry to deceptively hide radiation warnings using undersized font for user manuals is unacceptable. RF Radiation warnings must be made clearly visible and located prominently in the open so it can be seen. This is about consumers having “informed consent” – so they know the potential health risks and know how to use their cell phone as safe as possible. Since the 1990s, there have been hundreds of peer-reviewed scientific studies showing that long-term exposure to cell phone radiation can possibly result in reduced fertility, damage to fetuses, cardiovascular problems, brain cancer, and other harmful health effects. In 2011, the World Health Organization declared the radiation emissions from cell phones as a possible carcinogen. Since their announcement, numerous other countries have passed cell phone safety legislation including: England, Germany, Switzerland, Israel, France, and Finland. Recently, the Government Accountability Office criticized the FCC’s testing procedure for cell phone radiation and suggested they revise their test to be reflective of a modern cell phone user. The American Academy of Pediatrics added wind to the fire by writing a letter urging the FCC to reconsider its radiation standards. Sooner or later cell phone users will discover the truth – that cell phones aren’t the safe consumer devices you have been led to believe they are. In May, 2011, the International Agency for Research on Cancer convened over two dozen of the world’s top scientists who reviewed all the peer-reviewed studies published to date, including the 10-year, industry-funded, international Interphone study. Alarmed by the results, all but one of the scientists voted to classify the radiation that is emitted from cell phones as possibly cancer causing. In particular, the research showed an increased risk of malignant brain or auditory nerve tumors in those who had used a cell phone for 30 minutes a day for 10 years. DEJA VU – CTIA Wireless Association vs Another California City – Berkeley’s going to court! According to Kevin Kunze, producer of the documentary, Mobilize,’ the cell phone industry has already threatened to sue the City of Berkeley if they pass this ordinance’. The legislation to be considered by Berkeley simply requires that retailers inform their customers about information that is already provided in their user manuals. Esteemed Harvard Constitutional Law Professor Larry Lessig has expressed his opinion that this draft ordinance does not violate industry’s legal rights. Professor Lessig feels strongly that citizens have the right to be informed of this important safety information, and he has agreed to defend it pro bono all the way to the Supreme Court if industry files a lawsuit. On October 28, the Berkeley City Council will hold a meeting to consider a proposal to have cell phone retailers give consumers a handout informing them to not carry or use a cell phone in a pants or shirt pocket and to refer to their phone or user guide for the required separation distance. 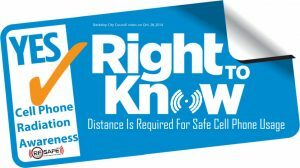 Cell phone “right to know” ordinance. The referral and briefing documents are available at http://bit.ly/BerkeleyReferral. informational handout referring the user to their cell phone manufacturers’ disclosure regarding the recommended separation distance for use against the body. 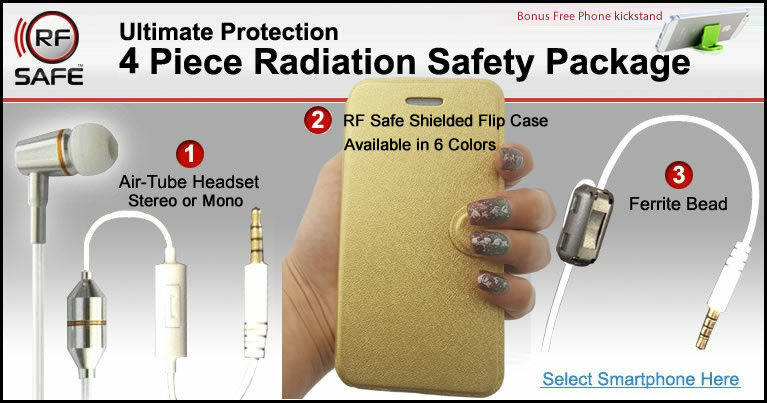 PLEASE SHARE THIS POST BECAUSE EVERYONE HAS A “RIGHT TO KNOW” HOW TO BE RF SAFE!